Throughout 1998, amidst all the pain, I was winning every race except the 5K runs. There was always someone from Yongsan Army Post, in Seoul, who'd come down to Osan and beat me. I was runner-up in four 5K runs at Osan, and won the other six races I entered. Competition wasn't too heavy at Osan. The base gym was pretty embarrassing in their planning. I made a few calls and was going to have a meeting with the staff to explain to them how to plan a race, but when I got caught up in the big command post exercise, that fell through the cracks. 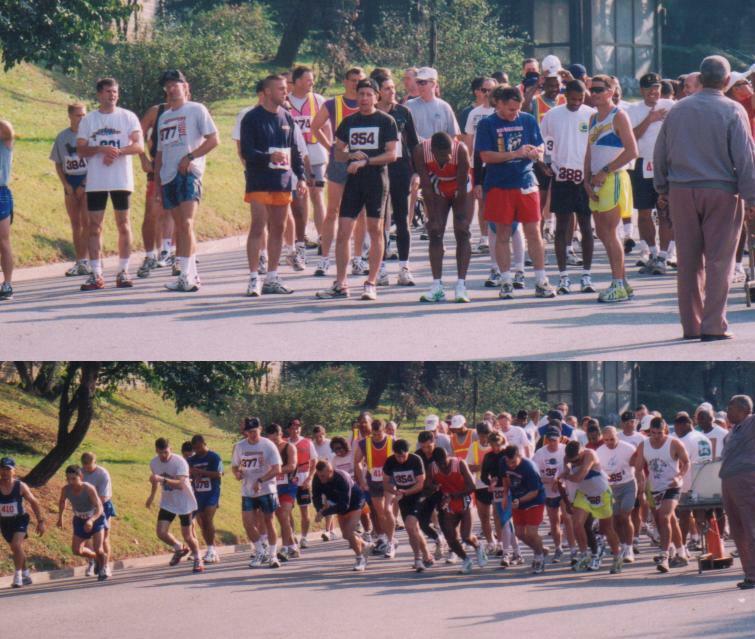 On October 24, Yongsan was having a 10K run over their hilly base. I'd been running well, had some amazing training runs at lunch, so I thought it would be fun to run with the fastest runners and have someone to chase. Aaron Lewis, my great friend and co-worker wanted to come along to Seoul, so I asked him to take pictures, since I had few race photos in 1998. He fed me Twizzlers on the bus ride to Seoul. It was cold, my hair was long, so I wore my 'Joint Theater Missile Defense' hat to keep body heat in, my high-drag hair down (I'm #354), and black to make me a hard target to track while absorbing the heat of the sun without being too restricting. It was odd that so many noticed my hat was backwards--that was simple aerodynamics, and the fact I didn't want to look at a bill. The race started ten minutes late, and I was complaining to Aaron that I'd been warmed up, but after standing at the start for 15 minutes I was getting cold again. What was the hold-up? A small group of about six runners went off the front at a fast pace. I was in close quarters with them and afraid of getting tripped, so I moved to the front of the group, then slowly pulled away. I didn't want to push early in the race...just get away from all the flying shoes and panting sweaty guys. I gained a lead of a hundred feet when this guy in red caught me (below) and I was going to let him go when I noticed Aaron on the corner, ready to shoot this picture. I couldn't let him get a shot of some guy passing me to win the race! So, for the sake of the photo I accelerated just enough to pull ahead for the photo. This acceleration was too much for red guy, and I led into a long downhill (which I excel in). I was gone. I took a few glances back and saw no one, so I concentrated on chasing the lead vehicle up and down hills so steep, that I'd slow to a fast walk at times. Aaron was waiting at the finish, and later told me they had their winner picked and, listening to the radio said, "He's going to take him now" or "so-in-so will catch him soon" but couldn't figure out who that weird guy in the 'backwards black hat' was, and why I was pulling away from their man. Aaron thought it was amusing at one point when he pointed out to them that if their man was going to take me, why was I widening my lead? It's like Aaron and I had conspired with Osan to play a bad joke on the Army. My ankle tightened toward the end (I'd been had ankle problems all year), but I won by a healthy 53 seconds with a time of 35:05, just ten seconds off my fastest 10K in 1989. The best part was, I'd won one for the Air Force! Woo hoo! J.T. Figueroa once chastized me in Japan for not throwing my hands up in the air in a victory salute--I forgot to do it again, more concerned that I hadn't beaten my best time.